Our license plates may read “The Sunshine State,” presumably to remind people from colder climates of Florida’s #1 year-round perk. But Florida could just as easily be nicknamed “The No-Tax-Me State” for the numerous tax advantages that accrue to residents who choose to make the state their primary residence. With baby boomers now marching headlong into retirement—just as municipalities, states and the federal government are aggressively seeking new sources of tax revenue to close gaping budget deficits—Florida’s status as a tax-friendly destination is garnering serious new attention. Here’s why: Florida is one of only seven states that impose no state income tax on its residents, and has safeguarded this provision in the state’s Constitution. Florida’s Constitution also bans the separate levying of estate or inheritance taxes—above the federal estate tax—and protects Florida residents from losing their homes to creditors other than their mortgage holders. Additionally, Florida homeowners are now constitutionally protected against the type of runaway home appreciation that occurred in many major markets during the housing boom. The “Save our Homes Act,” as amended by FL Voters in January of 2008, provides for an increased homestead exemption on a primary residence. Previously capped at $25,000, the assessed value of a property for tax purposes now has an exemption from the first $50,000 of taxable value—for all taxing bodies except the school district—and a $25,000.00 exemption on taxable value for the school district. Moreover, once the property is officially homesteaded, its assessed value for tax purposes can never rise more than 3% during any given year. Over the long term therefore, a property’s true market value will typically rise more than its assessed value, thus creating home equity from the difference between the two. A Closer Look from Other States: With new tax guidelines kicking-in as a result of the Fiscal Cliff negotiations of late December, residents of such heavily taxed states as New York and California are taking a much closer look at Florida. For example, where Florida residents pay in the neighborhood of $3.50 in total tax liability per $100 dollars earned, New York residents pay as much as $14.71 to state and local governments—in addition to what they owe federally—for every $100 earned. The same holds true in California, where taxpayers are now faced with a state income tax bill as high as 13.3%; and nearly a 52% combined federal-state income tax burden on earnings over $1 million. Businesses are also taking a closer look at Florida, which boasts one of the lowest corporate income tax rates in the country, where their employees would pay considerably less in personal taxes; and where commercial property values are presently much lower than in other parts of the country. Of course, with the sharp decline in residential home prices that has characterized the Florida market since the onset of the nationwide housing recession, those who move to Florida to start or join a business will enjoy the added bonus of deep discounts—while they last—on homes in every price range. Learning about the particular tax benefits of establishing a business or primary residence in Florida is best accomplished by consulting with your financial advisor or tax accountant. 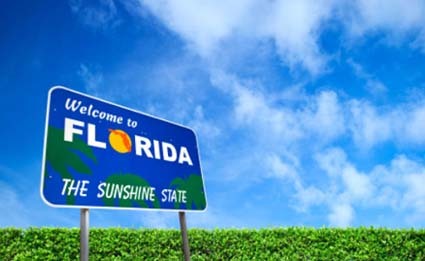 The brighter outlook for lower taxation in Florida—compared with most other states—is perhaps another reason why we’re dubbed The Sunshine State.